Each spring, the NRA convenes its annual meeting, an elaborate, multi-day affair in which the institutional links between the NRA and the firearms industry are on full display. In addition to the election of officers, the annual meeting is an opportunity for the NRA to honor its multi-million-dollar industry donors, known as “corporate partners.” Each annual meeting features an awards ceremony for the so-called Golden Ring of Freedom, allowing the NRA to honor donors (often CEOs at prominent firearm companies) who have donated a million dollars or more. 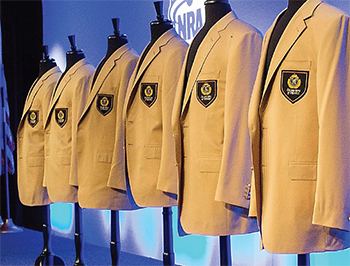 New inductees into the Golden Ring of Freedom receive golden jackets as a reward from the NRA. The NRA annual meeting also boasts the largest gun trade show of new weaponry open to the public, where firearm companies display and market their increasingly militarized products, including semiautomatic assault weapons with high-capacity ammunition magazines. The annual meeting provides a unique and revealing window into what the NRA and the gun industry have become. With the help of the NRA, the industry is relentlessly selling and marketing weapons with military-style firepower even as 33,000 Americans die from gun violence each year.